Parnell Thompson, LLC is proud to announce that Mark Parnell has been selected for inclusion in the 2019 Edition of The Best Lawyers in America©. He is being recognized for his practice in the area of Municipal Law. We congratulate Mark for this high level of distinction. Since it was first published in 1983, Best Lawyers® has become universally regarded as the definitive guide to legal excellence. Best Lawyers lists are compiled based on an exhaustive peer-review evaluation. Almost 87,000 industry leading lawyers are eligible to vote (from around the world), and they have received almost 10 million evaluations on the legal abilities of other lawyers based on their specific practice areas around the world. For the 2019 Edition of The Best Lawyers in America©, 7.8 million votes were analyzed. Lawyers are not required or allowed to pay a fee to be listed; therefore inclusion in Best Lawyers is considered a singular honor. 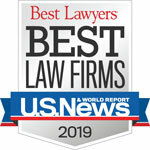 Corporate Counsel magazine has called Best Lawyers “the most respected referral list of attorneys in practice.” For more information, visit www.bestlawyers.com.